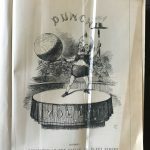 London, Published at the Office (Bradbury, Agnew & Co.), 1853-59, 1863-77, 1889-91. 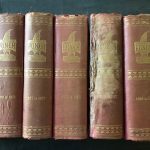 Folio, 11 books, each including three volumes, copiously illustrated. Vol. 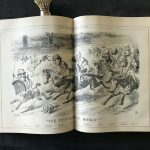 1: 1853-55: Vols XXV-XXVIII; Vol. 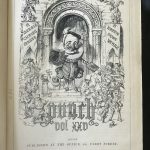 2: 1855-57: Vols XXIX-XXXI; Vol. 3: 1857-59: Vols XXXII-XXXV; Vol. 4: 1863-65: Vols XLV-XLVIII; Vol. 5: 1865-67: Vols XLIX-LII; Vol. 6: 1867-69: Vols LIII-LVI; Vol. 7: 1869-71: Vols LVII-LX; Vol. 8: 1871-73: Vols LXI-LXIV; Vol. 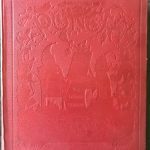 9: 1873-75: Vols LXV-LXVIII; Vol. 10: 1875-77: Vols LXIX-LXXII; Vol. 11: 1889-91: Vols XCVII-C. Vol. 10 (1875-77) with heavily dampstained and moulded back cover and final leaves. Generally in good condition, bound in publishers red buckram. Blind-stamped front covers, ruled along borders, with central panel framed by floral decoration with Punch’s iconic jolly dwarf portraying on canvas a dog posing with a plumed hat. Gilt spine with year sequences. Hinges starting and fragile spines.